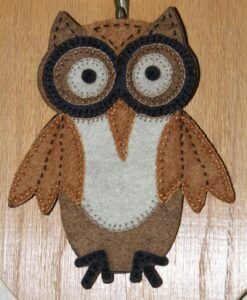 The last owl ornament was finished last night. 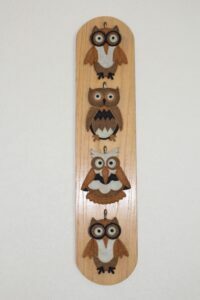 The owl ornaments are from Artsi2 and are approximately 5 1/4″ to 5 1/2″ tall. All the other ornaments that I place on the wall hanger are cross stitch. I like having something different to put there. Today I am busy packing for a sewing weekend with my middle daughter and one of her friends, so I should have some fun stuff to share on Monday. The Nifty Thrifty quilt top was completed last week. The top finished at 70″ x 81″. I like the scrappy border on it. However once it was done, I had a hard time finding inspiration to start another project. So I took a short sewing break to organize fabric and finish the machine quilting on the Bluegrass Frogs quilt. While machine quilting the Bluegrass Frogs the first time, I ran into problems with the monofilament thread breaking every 6″. I picked up a couple of different brands to see which one would work the best for me. I used the Aurifil thread to complete the machine quilting without any problems. There is one more side and the sleeve to finish hand stitching, then Bluegrass Frogs will be completed. 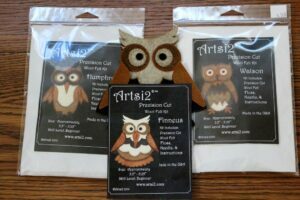 In addition to the machine quilting, I dug out four wool owl ornaments to work on in the evening. The first one is finished – three to go. It feels good to be excited about piecing again, so today I started on the orange Lincoln block. And yes, I did count the pieces in one block – 337. 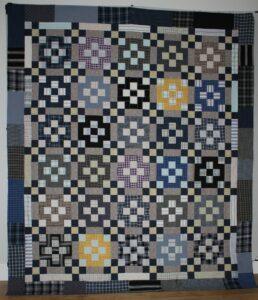 Hopefully by Sunday evening I will have the Bluegrass Frogs quilt and an orange Lincoln block to share.